Based near Dallas, Texas, and able to be deployed within one hour of notification, ASPECT is the only airborne stand-off real-time chemical and radiological detection, infrared and photographic imagery platform available to assist local, national, and international agencies supporting hazardous substance response and radiological incidents in the US. 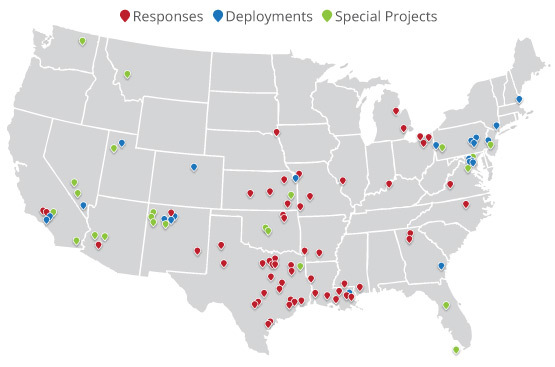 We've been deployed across the country more than 140 times since 2001 to support local, national, and international agencies with hazardous substance response and radiological incidents. Airborne ASPECT provides services through the Environmental Protection Agency's Chemical, Biological, Radiological, and Nuclear Consequence Management Advisory Division (CMAD), which provides 24/7 scientific and technical expertise for all phases of consequence management. Learn more about our relationship with the EPA. Copyright 2015, Airborne ASPECT, Inc.